A few days ago U.S. investors considered the idea of selling equity shares on news of the end of the government's quantitative easing program. However, they quickly changed their minds and opted to continue aggressively buying stocks. As it turns out, that was a great move....QE isn't dead after all, we are simply going to let other countries do the dirty work from here. Last night's BOJ QE bomb shell, and hints at the EU doing something similar, should keep the buyers in motion in the short run. 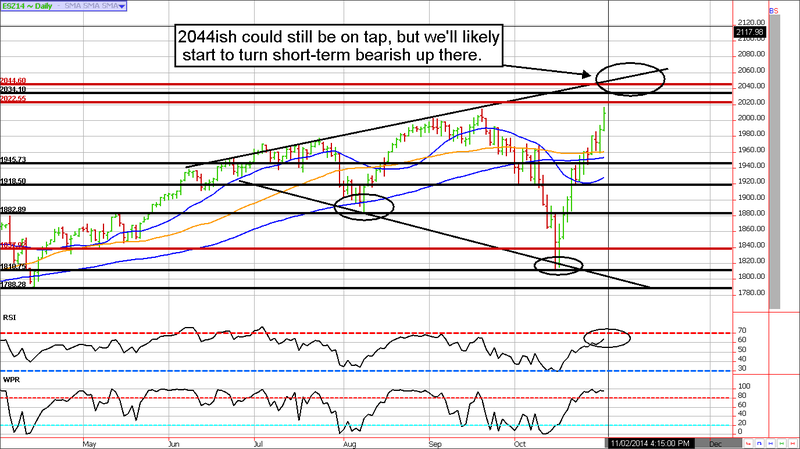 However, should the S&P start approaching our 2044 technical resistance area, we'll strongly consider turning bearish. Stocks are soaring, why aren't Treasuries selling off? There is clearly some underlying concern over the sanity of the equity market. You can see substantial investor doubt built into Treasuries. In theory, we should have seen money flow from Treasuries into equities on this move. Instead, we are seeing very little outflow from bonds. This tells us that "Main Street" is still nervous...They refuse to leave the safety of bonds, despite the "riches" that are being made by those long the stock market over the previous two weeks. 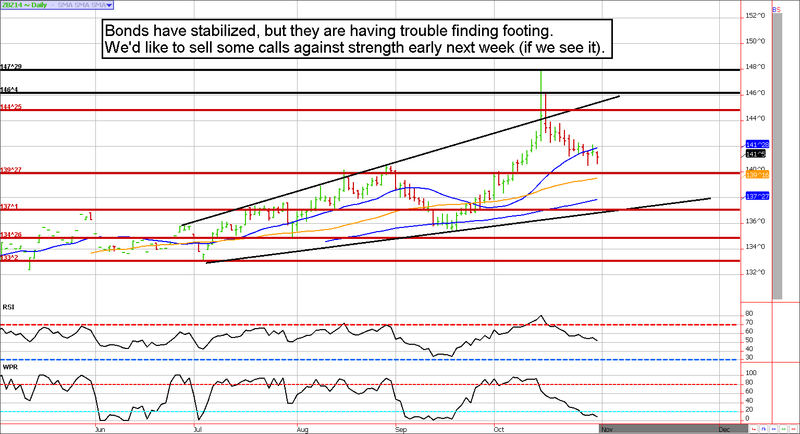 Until this changes, Treasuries will avoid what many believe to be the inevitable. We were hoping we'd see some sharp bouncing going into the weekend, but we were wrong. Nonetheless, now that the BOJ action has been reacted do we believe the Treasury market has a shot at a short covering rally early next week. If we get it, we'll likely look to sell calls against our short puts. **Consensus:** Support near 141 held, we'd like to see a rally from here. Look for resistance near 144'25. We've been bullish in the S&P since the middle of October; but even the bullish of the bulls couldn't have seen this coming. As fabulous as this rally has been for those that had plenty of ammo to act while prices were discounted, we can see in the price action that most of the "mom and pops" did the exact opposite. On the morning of October 15th, most of the "folks" likely capitulated through equity selling and bond buying. Meanwhile, speculators were clearly piling on the bearish trades in hopes of this correction being the "big one". Fast forward two weeks and we now now that these were ill-timed moves. I'd venture to say that most of the buying on the way up in recent weeks has been at the hands of short covering. Although some investors are clamoring to get back into stocks, it is clear they still have a lot of ammo (in the form of Treasury holdings that can eventually be sold with the proceeds used to buy equities). With this in mind, we suspect that this rally could reach 2044ish before finding any significant resistance. Should this price be seen, we'll strongly consider turning bearish. Sell Levels: Let's see what Monday brings. Buy Levels: Let's see what Monday brings.